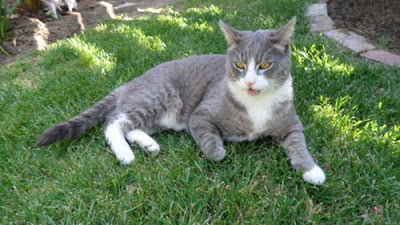 Los Angeles, CA–My name is William, and I am a grey, striped cat with white feet and a freckle on my nose. I live in a quiet suburb that is East of Pasadena called Monrovia if you must know. Most people don’t know where that is but is next to Arcadia. Anyway, that’s not what I want to discuss today. What I want to discuss is my catnip patch. I have my very own personal catnip patch under a fig tree. I realize I am lucky as many cats don’t even have a home much less their own catnip patch under a fig tree but still it’s mine. It’s green and lovely and I spend a lot of time in it. During the day there are no problems. But the minute the sun sets and I am in my house, and can’t get out no matter how much I meow, a black cat appears from nowhere and goes straight to my catnip patch. He smells and rolls around in it – like it belongs to him! I find this cat unbearably rude. What kind of cat just goes into someone else’s’ yard and then rolls around in their catnip patch? The other day I was so mad; I ran right into the glass sliding door and hit my head really hard. It made a loud noise and it hurt. It made me so cranky I couldn’t even enjoy the fireworks. It’s just not right. This just burns me up.